As with most types of vehicles, there are many types of Go-Karts. Although most Go-Karts look very similar to one another, there are actually some subtle variations between them that differentiate them. Electric Go-KartsWhen we think of the average Go-Kart, we tend to think of the traditional petrol-powered Go-Kart, but they can also be powered by electricity too. Electric Go-Karts are best suited to those who already have some experience of Go-Karting, as they can accelerate very quickly. On the plus side, they are quick and easy to handle, as well as being lower maintenance than their petrol-run counterparts, and cost less to insure. You can buy an electric Go-Kart for less than £200. They aren’t particularly competitive, but they suit anyone who wants to have their own Go-Kart, but isn’t bothered about having a top-of-the-range model. The battery packs also make it harder for the Go-Karts to flip over, as the added weight usually makes them too heavy. This makes electric Go-Karts safer to drive, as long as they are driven on flat ground. Unlike petrol-powered Go-Karts, they can be used in both indoor and outdoor Go-Karting. Go-Karts that are run on petrol can’t be used indoors because of the toxic fumes that they produce. As electric Go-Karts only use electricity to power them, they are also environmentally friendly. Most of the time, the type of Go-Kart that you choose will be influenced by the type of Go-Karting that you take part in. Speedway races mostly require Go-Karts that are specially modified, as there are only left turns on a Speedway circuit. To counter this, Speedway Go-Karts are designed so that the rear isn’t fully in line with the front, creating an asymmetrical look. The 125 cc shifter Go-Kart is one of the most popular types of Go-Kart, mostly because it is probably the closest that a Go-Kart can get to a Formula 1 car. For this reason, it is not included in the junior Go-Karting classes as it is designed to be driven by the more experienced Go-Karters who are looking for a Go-Kart that has maximum performance. With a top speed of around 125 mph, it is usually driven at circuits that offer sprint and endurance races. Shifter Go-Karts allow you to keep the engine at a constant RPM (Revs per Minute) if you know how to change gears. This allows shifter Go-Karts to go faster than most non-shifter Go-Karts that have the same kind of engine. They are more difficult to drive though, mostly because of the gear changes. Non-shifter Go-Karts mostly come in two forms: direct drive and clutch. With the clutch type, the engine doesn’t drive the rear axel chain until the engine reaches a certain RPM (the stall speed), whereas this happens automatically with the direct drive type. Direct drive types need to be push started though, while clutch types need a separate starter. Most Go-Karts may look similar on the outside, but underneath, they are not the same vehicles. 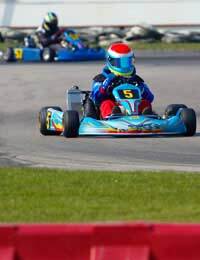 Certain forms of Go-Kart racing require different types of Go-Karts, so you will need to do your homework before you choose which type of Go-Kart to race in.